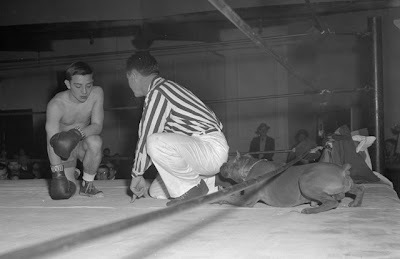 For a brief period of time, the convention of "throwing in the towel" to admit defeat in a boxing match was replaced by the less-than-successful "ordering a pit-bull to attack the referee" standard. August 26 marks the 88th anniversary of the 1920 passage of the 19th amendment giving women the right to vote. In Kentucky, the name Laura Clay (1849-1941) is synonymous with women’s suffrage. Born to politician Cassius Clay and Mary Jane Warfield Clay, Laura was educated at Sayre Institute in Lexington, Kentucky, and observed her mother running the daily operations of the family’s 300 acre estate, White Hall. When her parents divorced in 1878, Laura’s mother was left destitute and homeless due to laws refusing women’s claims to property. Clay credited this as the turning point which led to her decision to fight for gender equality. Working with Susan B. Anthony to organize suffragists in the state, Clay co-founded the Kentucky Equal Rights Association in 1888 and served as president until 1912. She was active in championing state legislation which led to increased age of consent, the right of women to enroll in formerly male-only institutions, women’s rights to make and sign binding contracts, and the right of women to control real estate. Clay was opposed to the ratification of the 19th amendment however, because she firmly believed in state’s rights and felt that the decision giving women the right to vote should have been made at the state, rather than federal, level. After ratification, Clay became a founder of the Democratic Women’s Club of Kentucky, became the first woman to receive a vote for the presidential nomination in 1920, and ran unsuccessfully for Kentucky Senate in 1923. She was active in speaking out and writing letters on contemporary equality issues until her death in 1941. 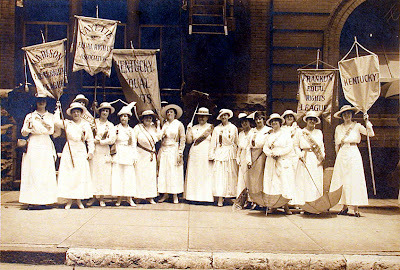 Photos: Laura Clay and fellow suffragists marching for the Kentucky Equal Rights Association at the Democratic National Convention in St. Louis (top). 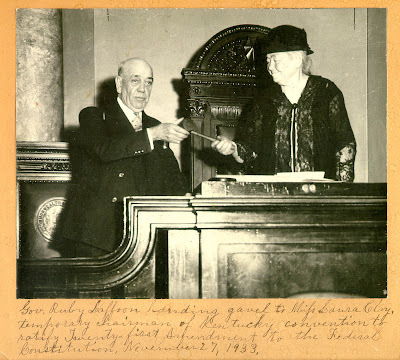 Kentucky Governor Laffoon handing the gavel to Clay to ratify the 21st Amendment (Prohibition), November 27, 1933 (bottom). For more information on Laura Clay, see the Laura Clay Photographic collection, and Laura Clay: Early Kentucky Suffragist. If you’ve been anywhere near campus over the last week, it’s been hard to miss the rows of college women lined up outside of sorority houses, walking across campus in summer dresses, or gathered around Memorial Hall in white dresses. 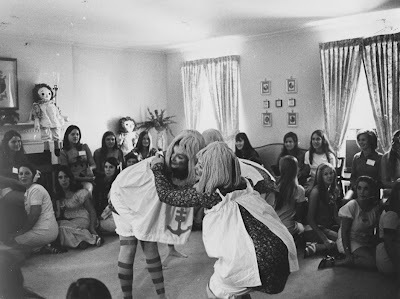 Last week marked the annual open house and recruitment week for UK sororities, a long-standing tradition which includes the 1,900+ sorority members and recruits. 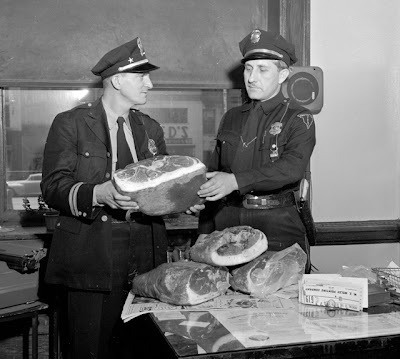 By 1950 the surge in cured meat crimes led Lexington police officers to the desperate measure of confiscating all hams out past curfew, absent a valid permit for third shift factory work. For area schoolchildren, summer is over and it’s time to hit the books again. 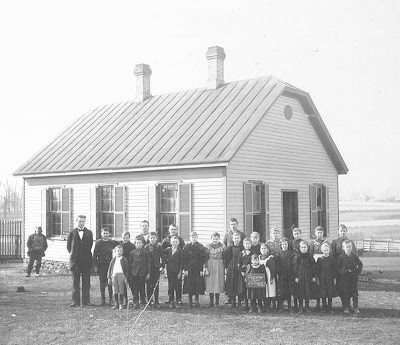 Almost everything about the back to school experience has changed dramatically over the past hundred years – from school supplies, to subjects, to mode of transportation. Everything, that is, except the dreaded school picture. 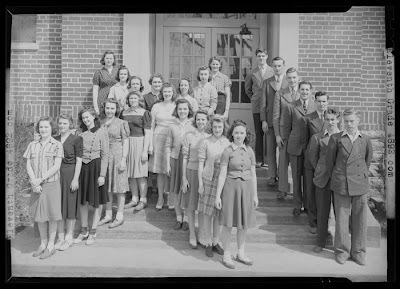 The above photograph shows the juniors at North Middletown High School (Lexington, Ky.) in 1941 lined up in the Roman numerals “XI.” Clever, no? 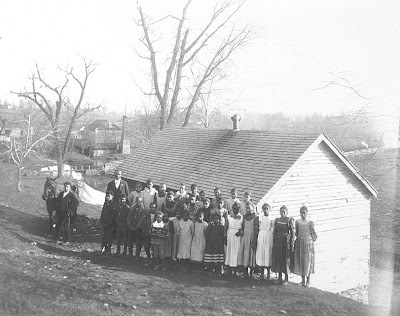 The two photographs below show a school for African-Americans in South Elkhorn, and a school in the Walnut Hills area (both in Fayette County) in 1901. 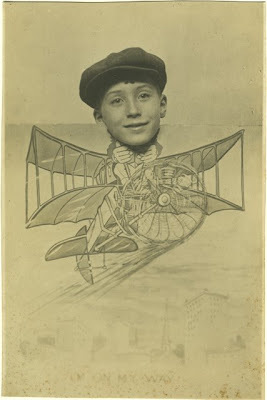 The North Middletown High School photo is from the Collection on Lafayette Studios, and the remaining two are from the Fayette County Schools photographic collection. As the Summer Olympics gear up in Beijing, here is a look back at the 1948 Summer Olympics held in London, England. 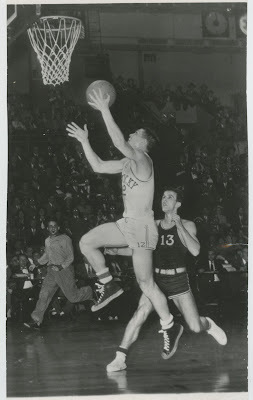 That year five University of Kentucky basketball players (that’s Basketball with a capital “B” around here) were members of the U.S. team and U.K. coach Adolph Rupp was the assistant coach. The U.K. players on the Olympic team were the starting five in their “day jobs” as college players: Wallace “Wah Wah” Jones, Ralph Beard, Alex Groza, Cliff Barker, and Kenny Rollins. This photograph is from the Russell Rice collection and shows the entire 1948 U.S. Olympic basketball team. 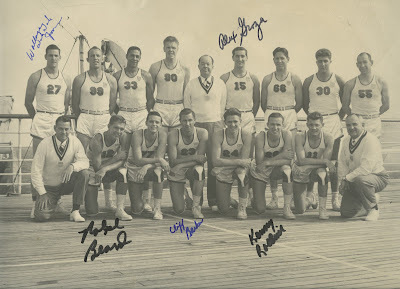 U.K. players are marked by their autographs and Adolph Rupp is kneeling on the far right. So how did the team fare? They received a gold medal after defeating France 65-21. This year, U.K. is sending the most Wildcats to the Olympics since 1948. The five athletes and one coach participating in the 2008 Olympics are: Tayshaun Prince, basketball, U.S.; Jose Avecedo, 200 meter dash, Venezuela; David Freeman, 1500 meter run, Puerto Rico; Mikel Thomas, 110 meter high hurdles, Trinidad and Tobago; Elvis Burrows, 50 meter freestyle, Bahamas; Erin Tucker, guest coach for sprints, Venezuela. On July 31, 2008, the Lexington Herald-Leader carried a story on the front page about UK’s plans to partner with a developer to renovate the three Reynolds Buildings on the w est edge of campus. The buildings have been used by the university since about 1953 and were officially acquired in 1959 for $100,000. 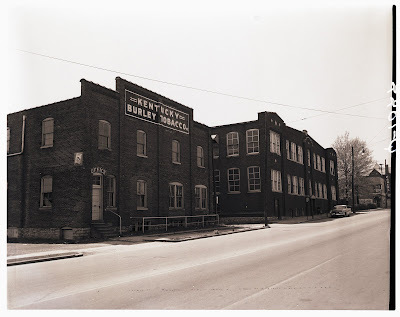 Before this, they were owned by the R.J. Reynolds Company and functioned as tobacco warehouses. 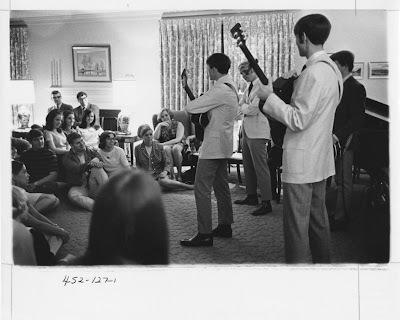 The School of Architecture was briefly housed in Building #1 before moving to Pence Hall, and the buildings have been mostly used for storage and art studio classes including sculpture, photography, metalworking, painting and videography since then. The Barnhart Gallery is also housed in building #1. The buildings have always elicited a mixed response. Their distant location from central campus makes them inconvenient and potentially unsafe, but students and professors who work in the buildings enjoy the spaciousness and the feeling that they are free to make a mess. However, safety has also been an ongoing issue in the buildings. 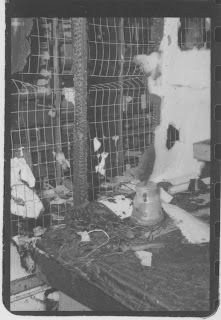 The two interior photos show an early morning fire which occurred in 1970. 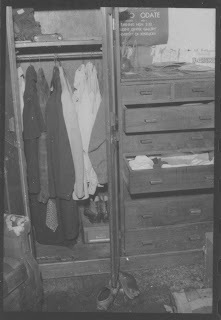 Interestingly, the image of a studio shows an armoire and dresser filled with clothes, documenting a long-standing practice of virtually living in the buildings. In 1989, a staircase collapsed, injuring four students, and in 1990, noxious fumes from chemicals used to repair the roof caused complaints of nausea and headaches. Security concerns resulted in a “controlled campus-to-campus walkway” between the Taylor Education and Reynolds Buildings in 2003. What are your thoughts on the Reynolds Buildings? If you were there when the staircase collapsed or have fond memories of working there all night, you can share them with us by using the comment feature. 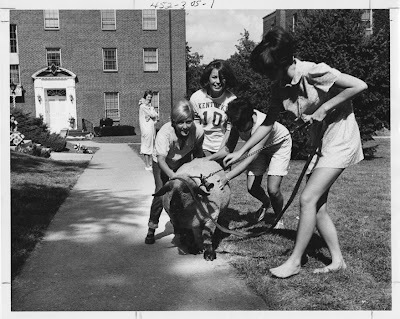 All photos from the Lexington Herald-Leader files held by University of Kentucky Archives. His expression is an odd mixture of bemused joy and just-been-struck-on-the-head-with-a-blunt-object dazed.